Do you love the idea of wildlife hanging out in your garden, or stopping by to visit your patio? We do. So, we did a little research to find out which flowers wildlife are attracted to. We wanted to get an idea of flowers that would be great for planting, or giving to someone, so that beautiful creatures would be enticed to come to our home or to our friend’s house. The following are some of the wildlife-friendly flowers we found. They’re gorgeous in their own right, but they’re even more special considering they’ll bring little critters to brighten our day. 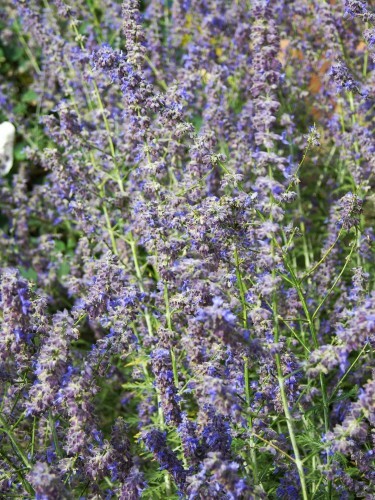 Russian Sage offers a scent that we love. But, deer don’t seem to like it so you won’t find these animals gathering around your sage plant. You will, however, see bees and butterflies flying around sage, looking for sweet and sumptuous nectar. If you want a perennial for your home that looks stunning and begs for big bumblebee beauties to come eat, choose poppies. They’re easy to grow, which makes them a perfect flower for newbie gardeners who want to welcome winged friends. Birds go crazy over serviceberry. The tasty berries on this plant are favorite meals of many fluttery creatures, including the brown thrasher. Oh, and many a wild human likes to eat these blueberry-like berries too. A never-fail garden flower, the purple coneflower is worth growing if you want to bring butterflies into your space. These flowers come in a variety of colors. So, when combined with butterflies of varying hues, you’ll have a rainbow for viewing in your yard. Chokeberry has a rather unfortunate name, because it’s actually a go-to flower for attracting wildlife into a garden. The chokeberry blossoms during spring, and during summer it gets pretty berries that birds adore. This plant’s foliage during fall is phenomenal. Plus, it grows well in most soil and sun conditions. We hope you’ll give these flowers a try in your home, for your sake and for the sake of the critters that live in your area. If you already have some of these flowers growing where you live, drop us a note and let us know what kind of wildlife come to enjoy them. Do you love the idea of wildlife hanging out in your garden, or stopping by to visit your patio? We do. So, we did a little research to find out which flowers wildlife are attracted to.We wanted to get an idea of flowers that would be great for planting, or giving to someone, so that beautiful creatures would be enticed to come to our home or to our friend’s house.